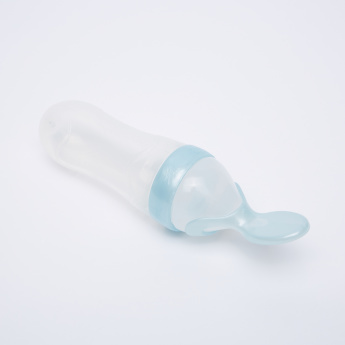 Nuby 3-Stage Squeeze Feeder | Multicolour | Safe and easy to use. Take your baby through the three stages of feeding by getting this squeeze feeder set. It comes with a teat, a spoon feeder and a sucker, all in one to give your child a complete feeding process from birth to toddler. Feature 2 : Ideal for travelling with lid which prevent from leaking. Feature 1 : Safe and easy to use.